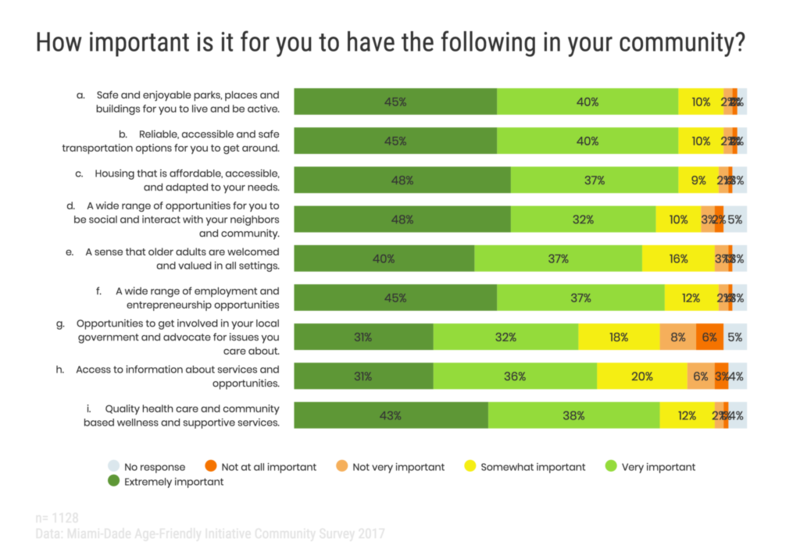 In 2017, two surveys were conducted to understand the current age-friendliness of Miami-Dade County as well as to help identify needs and areas of urgency for County. This data was analyzed and utilized to help develop indicators as well as to identify areas of focus for the initiative’s Action Plan for an Age-Friendly Miami-Dade and strategies moving forward. AARP conducted telephone interviews with 525 residents ages 50 and older in Miami-Dade County. 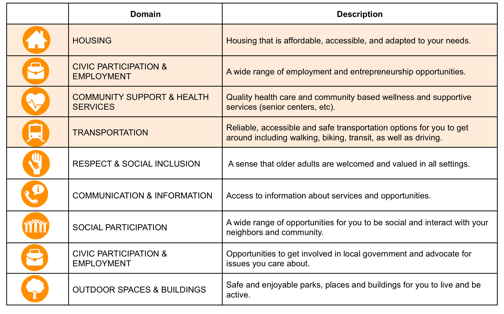 Survey respondents were asked to rate their community on 63 characteristics across the WHO 8 age-friendly domains. They were given a rating scale of excellent, very good, good, fair, or poor. The results from the study were weighted by age , gender, race, ethnicity, and AARP membership to reflect the distribution of residents ages 50 and older living in Miami-Dade County. The margin of error for the complete set of 525 interviews is ±4.3%. This means that if 95 out of 100 samples of this same size and population were given the same survey, the responses to the questions would fall within a range of plus or minus 4.3 percentage points of what would have been obtained if every resident age 50 and older in the sampled area were asked the same questions. The top-rated community features centered around the Community & Health Care, Transportation and Housing domains, with easy to read traffic signs and well-maintained hospitals and health care facilities topping the list. These were followed by other health care domain items concerning a variety of respectful and helpful hospital and clinic staff. Miami-Dade County residents also rate their community highly on having well-maintained homes and properties. 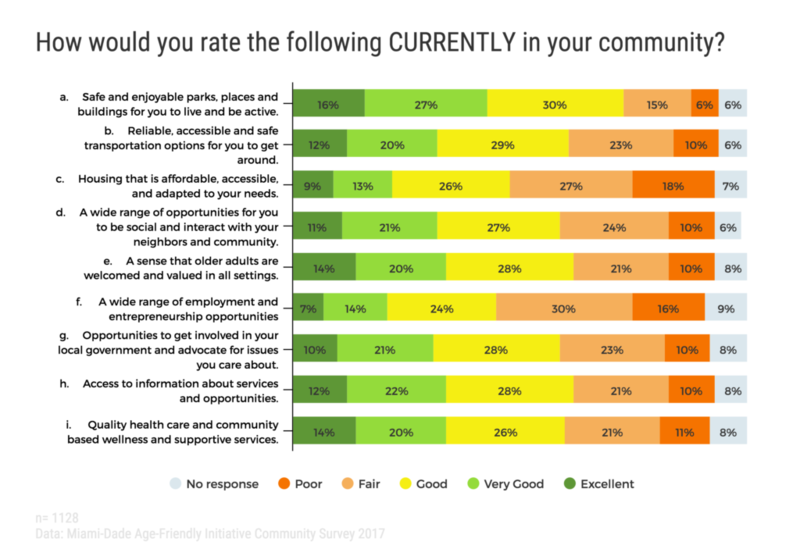 The Civic Participation & Employment domain dominates the list of the most low-rated community features along with one item in the Housing domain. Miami-Dade County residents age 50+ cite all four employment features asked about in the survey among the list of the most low-rated features. These features center around having flexible job opportunities for older adults and policies to ensure people can continue to work as long as they want or need to. Another area for improvement according to Miami-Dade County residents is having more affordable housing options in their community. The majority of Miami-Dade County residents age 50+ believe their community is a good place to age and want to live there independently for as long as possible. 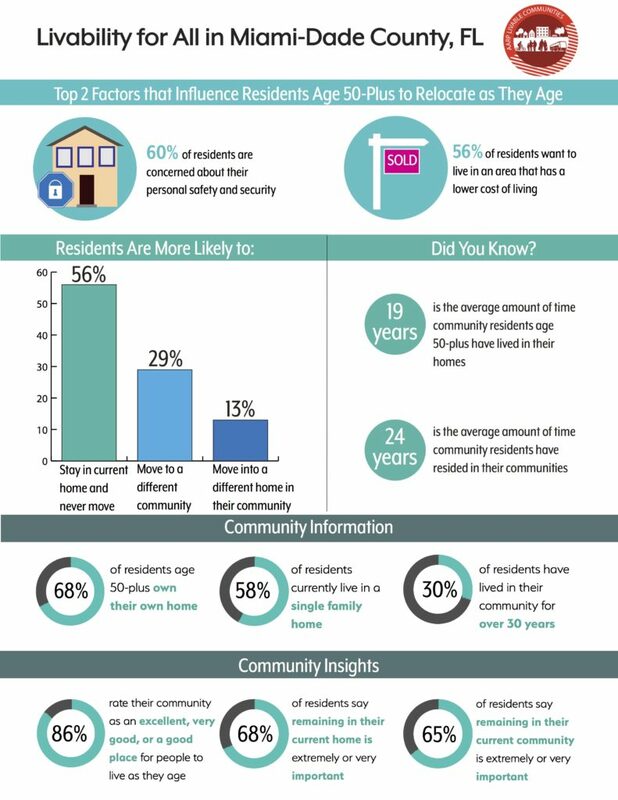 Residents age 75 and older are more likely than younger residents to say that staying in their community as they age is extremely or very important. 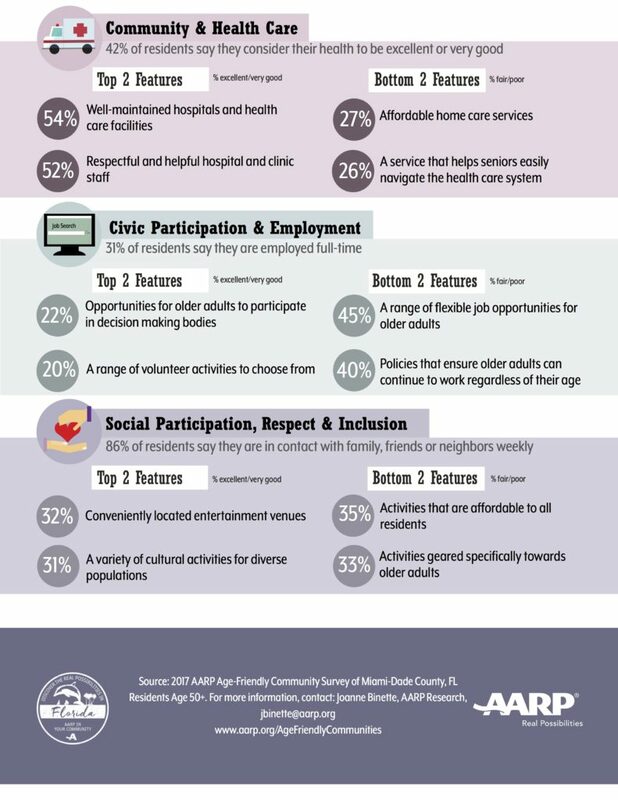 The following pages depict infographics produced by AARP Research showing additional results from the survey. To add to the research conducted by AARP Research, the Miami-Dade Age-Friendly Initiative also developed a short survey that looked broadly at each domain of livability and surveyed an additional 1128 individuals age 50+ who reported living in Miami-Dade County via convenience sampling through paper and online surveys. These were distributed and collected through leveraging partnerships through the initiative and through distribution at senior centers and through the help of community liaisons. The sample size of 1128 individuals surveyed represent a 2.9% statistical error at the 95% level of confidence. The respondents were asked questions related to each domain of livability and were asked how important each domain was as well as how they would rate the current status in the community. In addition to looking at the urgency overall throughout Miami-Dade County, we also looked at the urgency by Commission district and every district included Housing as an urgent need. Others urgent areas that were also seen matched those in Miami-Dade overall – related to employment, transportation, and community health and supportive services. This is not to say the other areas are not important, but the areas above were at the top of the list due to urgent attention. Other areas, such as Outdoor Spaces & Buildings that are at the bottom of the urgency matrix are also very important and are likely less urgent due to the work that has already been accomplished in this area such as the Miami-Dade Parks, Recreation, and Open Spaces Department’s Active Older Adults programming and senior-friendly hubs. 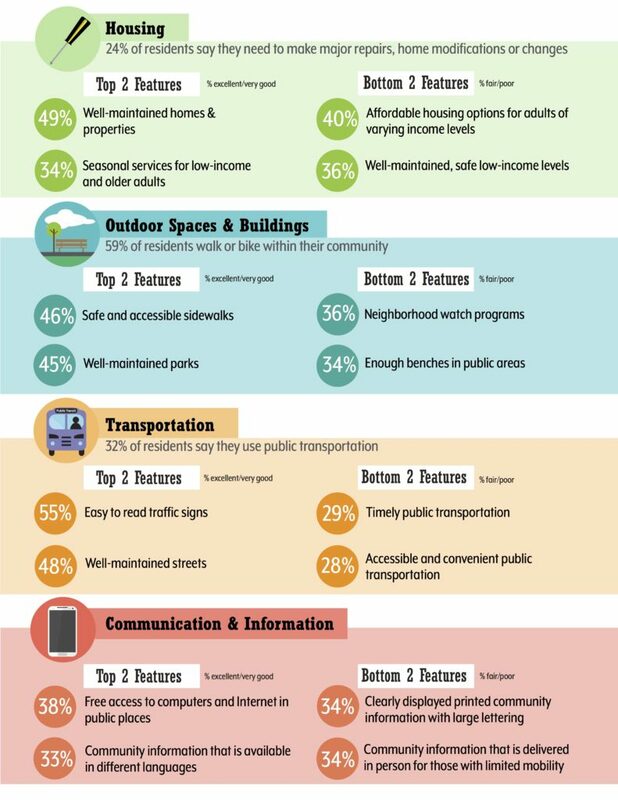 The following pages highlight some of the results of the short survey including responses related to each domain of livability and the urgency matrices developed for Miami-Dade.